Born and raised in Virginia, Molly Bishop graduated from the VCU craft/material studies program in 2012. Working mostly in clay, she draws inspiration from the natural world, particularly reptiles, and travel. After spending 5 months living in a plumber’s truck and traveling cross-country, she has an appreciation for all the little creatures across America. She is an avid sketchbooker. She has work in the permanent collections of her mom and boyfriend. My ceramic pots say things aloud that I can’t, they are my way of relating to the rest of the world. Functional dinnerware is my subversive canvas. Telling a story, sharing a memory, or simply venting through images and sentences carved into clay helps me sort out my thoughts. The seemingly melancholy or negative statements on my pieces are in fact quite hopeful: they give voice to an idea that you most likely share, but don’t want to say aloud. In social situations, I often find myself being overly honest and sharing too much of what I’m thinking. Through ceramics, these thoughts can pair with funny images and lose their soberness. 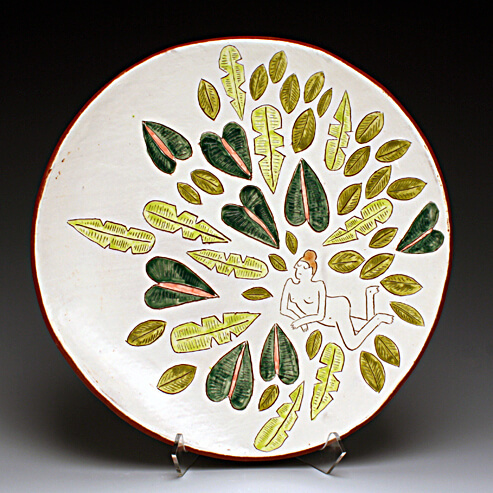 The colorful glazes and goofy imagery makes them playful. Handbuilding the pieces and showing their imperfections helps add to the intimate, secret-sharing experience of my pots.